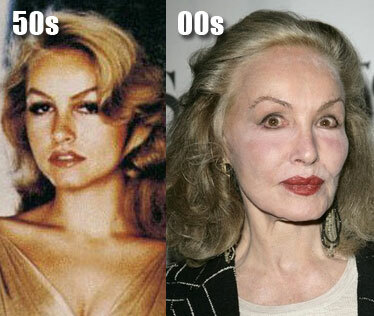 Julie Newmar before and after plastic surgery. How could anyone forget iconic actress, Julie Newmar, best remembered for her role as Catwomen on the 1960s television series Batman. The timeless actress is now well into her seventies, however she isn't conceding to the inevitable effects of aging, in fact it would appear that Ms. Newmar has gone great lengths to halt her beauty from fading. 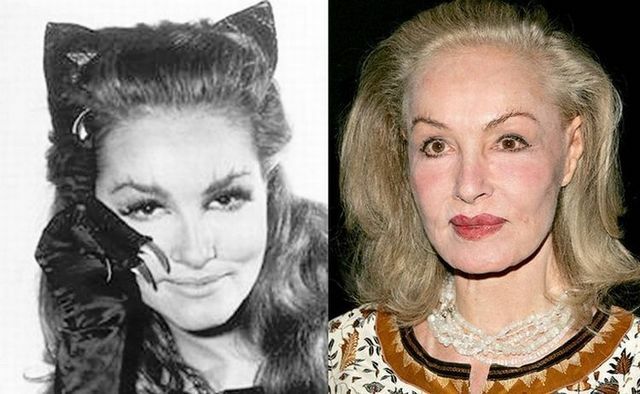 Julie Newmar seems to have chosen the plastic surgery route, while searching for the fountain of youth, and these before and after photos would suggest shes undergone procedures such as a facelift, brow lift, facial fillers, lip injections and last but not least, botox injections. Some have suggested that the results of her plastic surgery makeover was a sensational success, which wiped away years from her appearance, and while I'll agree she doesn't quite look her age, Ms. Newmar also doesn't look very natural either. So ladies and gentlemen of the jury, i ask you, what is your verdict in the case of Julie Newmar vs. the plastic surgeons scalpel? These pictures were taken 50 years apart - that is just plain silly!